How much does it cost to host a website in 2019? We have recently revised this article with details on 2019’s website hosting prices to help you remain up-to-date on this niche. 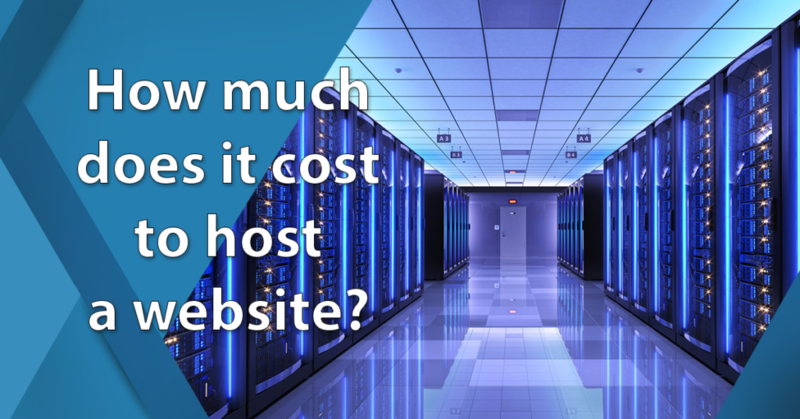 How much does it cost to host a website? If you self-host the cost can range from $1,100 to $3,800 initially, which includes not just the actual hosting, but domain, security, web development, maintenance and, for ecommerce, payment processing. The cheaper alternative is to get a hosting provider, the cost of which depends on the provider, which we’ve spelled out in this guide. Hosting Services – the most common type where you “rent” space from the servers of web hosting providers such as HostGator or InMotion Hosting. Hosted Platforms – create your online business, store, or blog on platforms with built-in hosting such as WordPress, Wix, or Shopify. Host Your Own – a self-hosted website where you take care of everything. Whatever option you choose, it will cost you something, even on free hosted platforms such as extra bandwidth or storage space. Hosting a website, especially a business or ecommerce site, involves a lot of things. You have to ensure that your site loads fast because one study showed that almost half of web users are likely leave a site if it does not load within three seconds. And to think that 8 out of 10 American are now online shoppers, you need to make sure that your website is responsive to take advantage of the trend and get more customers buying from your site. The aforementioned and many other things essential to a business website such as uptime, reliability, security, site management, online payment and order processing capability, scalability, bandwidth, and storage capacity, are often taken cared of by hosting services or hosted platforms. The question of how much does it cost to host a website in 2019 will largely depend on the features and functions you’ll require from the numerous hosting providers available out there. If you’re a small company this handy guide on the top 20 web hosting services providers for small business is a good start to choose the right provider. You can opt for a self-hosted platform, although this is not something that’s advisable for a starting business because of the costs and the challenges. Total: $1,100 to $3,800 initially. And you have to set aside $600 to $2,800 per year for maintenance and optimization. The above cost estimates assume that you outsource some of the work because you can’t possibly handle everything yourself especially when it comes to technical, security, and maintenance aspects. If you go the DIY route, you’ll be responsible for monitoring your server, doing regular backups and updates, and all other maintenance to make sure that your system is in tip top shape and running smoothly. Anytime you experience bugs and breakdowns, you’ll have to undertake troubleshooting yourself. If you are an ecommerce or online store, this area is something that needs utmost care and consideration. The safety of your online business is in your hands, and these include PCI (Payment Card Industry) compliance and SSL certification aside from ensuring that you have in place robust security measures such as spam and DDoS protection, firewalls, network security, and secure storage, among others. How much does it cost to host a website in 2019? For a startup or small business, the cost and challenges and many other factors could be too big to undertake and may end up more expensive. Furthermore, you’ll be consuming lots of precious time that should instead be devoted to your business. That is why for small growing businesses and even for established ones, getting hosting services is a popular choice for reasons enumerated below. Jut to compare, let’s have a look at what InMotion Hosting offers with their dedicated server plan. Depending on your budget and requirements, your website can reside on shared-hosting servers, virtual private servers, or dedicated servers. The hosting service will provide you the bandwidth and storage you need, guaranteed uptime, updates and maintenance without site disruption, help in data migration, safety and security, site building and editing, personalization and customization, branding options, integration and add-ons, technical support, and many others. In other words, they’ll do the heavy lifting so you can concentrate on growing your business. Monthly subscriptions plans and prices can range from $10 and below to $100 and up, with choices in between. Many offer generous discounts and even freebies when you opt for straight 12-month plans. Our detailed list of top 20 web companies of 2019 will introduce you to some of the leading hosting providers today and their offerings. If you think about it, you’ll realize lower operating costs and better savings in the long run with a fixed monthly plan price that contains the features you need. A web hosting service will provide you reliable servers in sophisticated data centers. You’ll be guaranteed 99.99% uptime, the latest high-end hardware and software, round-the-clock network monitoring, automatic backups and updates, and regular maintenance. What this means is that your website will be open and accessible all the time and will be loading fast. It also ensures that servers housing your website will be free of irregularities or potential issues and that any errors no matter how small will be detected and attended to before they become big problems. These are areas vital to your business that must be up and running smoothly 24/7. In relation to dependable servers, hosting services will make sure that your website is safe and secure. They will employ automatic updates, security audits, virus and malware scans, spam filtering, firewall configurations, DDoS protection, and other network/web security protocols. These are added security aside from the safeguards that you install on your website such as passwords, two-level authentication, and user level permissions. You can also have a secured, centralized cloud location where you can store and manage all your files and documents. Moreover, some hosting services tuck in free or affordable domain name registration and SSL certificate, the latter for extra data safety especially if your website processes and accepts online payments. Another thing you can rely on with hosting services which you don’t have if you self-host is customer support. This can come in many forms – an online customer portal that contains troubleshooting solutions; a knowledge center on the hosting provider’s website that consists of tutorial videos, how-to guides, FAQs, webinars, and other helpful resources; ticket system; phone or live chat; and email support. These support services are often available 24/7 giving you anytime access to the provider’s help desk team, technical personnel, and resource database. If you’re self-hosting, you’ll have to find solutions on your own when problems crop up and you’re website in down. With hosting services, any hint of a problem and you can have dependable support to turn to. Web hosting services usually include many helpful features in their plans such as website builder and editor with built-in themes, layout templates, and image gallery so you can quickly create professional-looking websites; website admin and email management tools; DNS management; and integration with or easy migration to content management platforms such as WordPress, Drupal or Joomla or with ecommerce platforms such as Shopify or Magento. Also normally offered are backups and disaster recovery; affiliate programs with credit or cash rewards for referrals; ability to monetize content on Google or Bing; partnership with dozens of app and plugins useful for your business; and more. Getting all these features separately while self-hosting may not be feasible. Even if it is, it may be cost-prohibitive. There are several web hosting services available today that you would be hard put to find the best one to match your needs. We’ll help you on that by giving you the top five hosting providers in our database. If you need more details, just click on the link provided for a more thorough review of each service. InMotion Hosting is a popular and highly-rated web hosting service that offers fast web hosting, secure servers, and easy set up. It is ideal for developing and growing business since it is scalable and makes the transition to a different package seamless. The provider utilizes PCI-compliant data servers and invests regularly in new technology, ensuring that you have the latest hardware and software to power your website. Among other things, InMotion Hosting offers shared hosting, VPS hosting, and dedicated servers; affordable hosting packages for small to medium-sized businesses; SSH and eCommerce hosting; cPanel Education Channel for tutorials and articles including FAQs; and hosting for well-known content management systems such as WordPress, Joomla, Moodle, OpenCart, and PrestaShop. For more information on their services you can visit InMotion Hosting website. What it will cost you: From $5.99/month for shared business hosting to $99.99/month for dedicated servers with five low-cost plans that you can choose from. There are also higher-end custom pricing for special requirements and specs. Catering to over 29 million customers across 39 countries, Hostinger delivers one of the fastest and most reliable hosting servers at affordable prices. It offers a 99.99% uptime guarantee alongside an average of 70-80 ms load speeds for optimal performance and unimpeded online operations. Despite it’s cheap web hosting pricing options, Hostinger does not skimp on functionalities and essential tools as users are given access to exceptional round-the-clock customer support, daily/weekly backups, free domain, and others. You can sign up for a Hostinger free trial to test its features and services firsthand. What it will cost you: $0.80/ month for its single shared hosting option nets you a domain, one email account, 100GB bandwidth, and 10GB SSD space. It also includes some essentials and benefits such as weekly backups, one-click installer, file manager, round-the-clock customer support, and more. Meanwhile, pricing starts at $3.95/month for VPS hosting and $12.98 for dedicated servers. Hostwinds is a solid web hosting provider for it offers shared web hosting, business hosting, Linux VPS, Windows VPS, and dedicated servers with 99.999% guaranteed uptime. It’s a top choice for it also caters to other essential web hosting needs like domain registration, provision of SSL certificates, and 24/7 maintenance. Hostwinds also offers cloud server packages that can be set up in less than a minute. It has two data centers with natural cooling systems and a redundant A+B power source that allow it to provide failsafe features and mechanisms to its users. Hostwinds is a leading web hosting company that has been in the business for almost a decade. It boasts of its 24/7 customer support to local and international users. The company is confident with the quality of its service for it even offers a 60-day money back guarantee for all users who will find themselves not satisfied after two months of giving their services a try. In addition, its two data centers have 24/7 armed security, recorded video surveillance, and check-in stations. You can sign up for Hostwinds here. What it will cost you: Hostwinds and its services are available for as low as $3.29/month. The price range and package rate increases depending on features and tools added. Dedicated servers are offered for as lows as $67.50/month. HostGator is a powerful hosting solution that is currently the choice of over nine million users. It specializes in website, VPS hosting and dedicated services and offers some of the most affordable cloud-hosting packages around. It guarantees two times faster performance and four times enhanced scalability; in other words, it is built for speed. HostGator is also known for providing a streamlined hosting experience, as a support team is there to assist you round-the-clock and ensure 99.9% uptime. It boasts of power back-ups, fire detection and constant monitoring to keep its 12,000 servers safe and secure; 10 different fiber providers, including hardware from Time Warner and AT&T; RSS feed for service status updates; as well as partnership with technology providers Cisco, AT&T and Dell. What it will cost you: Lowest plan starts at $4.95/month while at the other end for dedicated servers go for $119/month. In between, two other budget-friendly plans are offered. GoDaddy is the grand daddy of hosting, presently serving more than 17 million users and supporting 72 million domains worldwide. It is the largest domain name hub and hosting service provider, and is well noted for its secure servers. GoDaddy is also known for its focus on the corporate community as well as affordable SSL certificates that guarantee the safety of each user’s data. Aside from a solid and established reputation, it offers website, business, WordPress, VPS, and dedicated hosting; a hands-on website builder for novice users; business-friendly .store domains; user control over their websites; and 24/7/365 support and professional assistance. What it will cost you: Starts at $64.50/month and the prices go up depending on server specs, hosting type, and features. Bluehost powers over two million websites worldwide through its robust and cloud solutions. It features an easy to use interface, low pricing plans free domain and site builder, and dedicated 1-click installer for WordPress users. In fact, WordPress.org recommends Bluehost as its number one provider for easy installation and management. Bluehost offers cloud, VPS and shared hosting, dedicated services, and reseller hosting, all of which comes with 24/7 support. It utilizes 100% in-house services with its own fiber connections, data centers, and custom Linux kernel operating on custom-built servers. It is likewise recommended for PHP applications that require lightweight CMS installs such as Joomla and Drupal. What it will cost you: $2.95/month for shared hosting while dedicated server plans are pegged at $119.99/month. iPage serves multiple geographies, offers standard cloud and WordPress hosting, and sells exclusive domains for teams that need marketing and placement services. Aside from business packages, the provider also provides intuitive, code-free website management process ideal for personal, non-profit, and social brand websites. The eco-friendly hosting company uses wind energy to power its servers, offices, and data centers. It offers overall uptime of 99.84%; VDeck cPanel for eCommerce services, website and email management; free domain registration; unlimited email accounts; unmetered bandwidth and disk space; and constant monitoring of your data. What it will cost you: $1.99/month for the Essential plan and $199.99/month for the Enterprise plan, with five other plans in between. Web Werks Data Centers provides web hosting services at prices that won’t break the bank. With a 99.995% uptime guarantee, this provider ensures uninterrupted services and reliable Tier IV data centers. It provides exceptional round-the-clock customer support as well, in case users encounter any issues or need assistance. Web Werks Data Centers provides more than hosting packages, offering email hosting, disaster recovery, enterprise storage servers, and colocation services, among others. This web hosting service provider is used by a number of notable international brands including Bacardi, Canon, HP, TATA, Sunsilk, and more. What it will cost you: Dedicated servers start fro ₹3,900/month, while VPS hosting starts from ₹1,625/month. Host Mayo marries quality hosting solutions with with affordable pricing plans. Equipped with all the web hosting essentials to meet one’s unique needs, Host Mayo pairs cutting edge technology and reliable servers alongside wallet-friendly pricing packages to ensure everyone can pick a suitable option. This provider supports popular control panels for top quality tools, MariaDB Database for reliable SQL server, pure SSD for faster speeds, and a 100% uptime. Basically, users will have a good and smooth user experience with Host Mayo without worrying about being plagued with server downtimes. What it will cost you: Price starts from $1/month for the Pure SSD Web Hosting Starter plan, $2.50/month for VPS, and $30/month for dedicated servers. You can only boost your rankings and improve your profits if you have a fast and responsive website that visitors and customers alike enjoy going to and navigating. A reliable web hosting service is largely responsible for that. A speedy, well-designed and maintained, and secure website will spell the difference between visitors staying or leaving your site in a matter of seconds. And that will impact on your conversion rate, sales, and revenue. Web hosting services provides you cost-effective options, and could be your way to better profits down the road. What are the Benefits of Dedicated Hosting over Shared Hosting? I agree to publishing my personal information provided in this comment. How to do effective project risk assessment? What are the main pros of Atera? What is the best invoicing software for Mac? What is the best cybersecurity software company? FinancesOnline is available for free for all our business professionals interested in an efficient way to find top-notch SaaS solutions. We are able to keep our service free of charge thanks to cooperation with some of the vendors, who are willing to pay us for traffic and sales opportunities provided by our website. Please note, that FinancesOnline lists all vendors, we’re not limited only to the ones that pay us, and all software providers have an equal opportunity to get featured in our rankings and comparisons, win awards, gather user reviews, all in our effort to give you reliable advice that will enable you to make well-informed purchase decisions.